There are relatively few authors who consistently manage to write solid contemporary YA fiction. Jennifer E. Smith is in a rare category. Her first book The Statistical Probability of Love at First Sight was so good, so unique that she became an auto-read author for me. The Geography of You and Me is not quite as good as her first novel, but it is still far better than most contemporary YA. I didn't read the synopsis carefully so I assumed that the entire book took place during the New York black-out. It doesn't. The black-out is the first quarter or third of the novel, but time passes after that. The book takes place over the course of a year. I'm glad Smith chose to have a longer time frame. The 24 hour time worked really well in Statistical Probability but is such a novel technique that it would be hard to get it right twice. With the longer time frame, we have the ability to get to know Lucy and Owen better as well as their families. In a single evening, Lucy and Owen form a connection that lasts over time and across the world. This sounds like the worst kind of insta-love, but it's not at all. Something clicked between the two of them that night. There were no fireworks, no protestations of everlasting love. Just a feeling that lingered so strongly, it compelled Lucy and Owen to keep in touch. Randomly, Lucy and Owen's initial meeting reminds me of a quote from You've Got Mail shortly before Frank and Kathleen break up. He's interviewed by a journalist who clearly fancies him, although nothing's happened between them. Frank tells Kathleen, "Well, I think there's-- There's, uh, something there." (not the most romantic thing to say to your girlfriend about another woman). Lucy and Owen both leave New York shortly after the black-out. After that, it's like two separate books. They keep in touch vaguely, but their stories only occasionally overlap. Lucy moves with her parents to Edinburgh. Owen travels with his father across the country trying to find work and a place to settle. I adored reading about all the cities where Lucy and Owen went to. Especially Edinburgh for Lucy. I spent two weeks there in 2001 and adored the city. I also enjoyed reading about Owen's time in Lake Tahoe and San Francisco, two areas that I also know well. I'd spent a significant amount of time in almost every place the characters went, so this book put me on a nostalgia high. If you like armchair travel, this is the book for you. Lucy and Owen are rather non-descript characters. That's not necessarily a bad thing. They are normal teenagers. Lucy is quiet and bookish, not the kind of person who has a lot of friends. She gets out of her shell when she moves to Scotland but she is still reserved. Owen would be a funny, gregarious guy, but he is mourning the recent death of his mother. He essentially travels around with a personal stormcloud over his head. Plus, he and his dad are barely scraping by, which makes Owen grow up much faster than he would otherwise. To my surprise, Owen's father and Lucy's parents are significant characters in this book. Owen has a wonderful relationship with his father. They've bonded together in their mutual grief over his mother's death as well as their poverty. Owen's father wants to give his son a happy life. In turn, Owen is willing to sacrifice many things to make his dad's life better. It's an unusually mature relationship. Lucy's parents at first come off as cardboard villains. When the book begins, they've gone off to Europe on holiday leaving Lucy alone at home. They apparently do this often. I expected them to be these horribly neglectful caricatures, but they weren't. They clearly loved Lucy and she loved them. It's like they wanted to have a strong relationship but didn't know quite how to do it. I enjoyed seeing how Lucy's relationship with her parents shifted over the course of the book. "The odd thing about this form of communication is that you're more likely to talk about nothing than something. But I just wanted to say that all this nothing has meant more to me than so many... somethings." 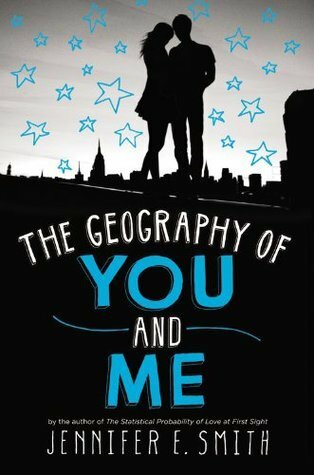 The Geography of You and Me is a hard book to write a review of. It wasn't the fastest paced novel I've read or the funniest or the saddest or the most romantic. And yet there was something about it that felt right. That made me happy. There's not much more that to look for in a book than that. I haven't read anything by Jennifer Smoth yet, but all her books sound really cute! I can' say I have read many YA contemporaries that I've loved so far, so I'm excited to try some of her books out! "For a book that is ostensibly a romance, there is very, very little romance." Hmm...I'm going to edit how I wrote that sentence. That came out the wrong way. This is a romance but just not in the kissy kissy way. You keep calling Owen "Oliver." Jennifer really does like her boys with O names, doesn't she? I'm glad to hear that this book is good. Smith became an auto-buy author for me as well with SPOLAFS. Can't wait to get my hands on this one. I read the first The Probability of Love at First Sight. It was pretty good. I look forward to reading this one!! This book sounds lovely. Thanks for the heads up about the limited amount of romance in it. I will make sure not to pick it up when I want a romance book. I still haven't read a single book from Jennifer E. Smith - but I always wanted to. I was not sure I'd like the 24 hrs time frame, I'm happy to hear this one has a different setting. I've only read This Is What Happy Looks Like of hers, but I agree that it was a pretty solid contemporary. And that's coming from someone who isn't really into contemps. It also featured parental relationships pretty heavily and wasn't just about the romance, which I liked. I love armchair travel so I'm pretty sure I would love this one, as well! And I should definitely get around to reading The Statistical Probability of Love at First Sight, as well. I love this author so I'm pretty sure I'm going to like this story.